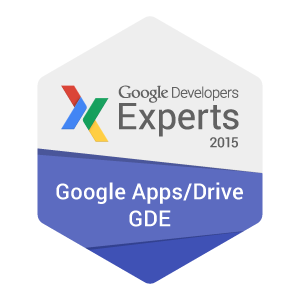 Google Developer Expert writes about Google Apps Script, Google Cloud Platform, machine learning, internet of things, .. I'm using Google Apps Script for a lot of things - from automate tasks to data analysis. I have discovered, that there was repetitive use-case: scrape data from web and parse exact value from HTML source code. If you are novice in programming, you probably know, that's difficult to write and use regular expresion. For me too :) I have written Google Apps Script library, which helps you to parse data in 5 minutes. Let's create a small example. In our company we have created a Google Apps application SignatureSatori to create and setup email signatures for all users in domain. Like a good growth hacker I benchmark the competitors how quickly get new users. There is a Google Apps Marketplace, which estimate number of users. I need save that numbers each day. Parser library takes three parameters - input text and pattern which bounds desired text. 2) Now open desired web-page (e.g Chrome Webstore in our case). Click on specify HTML element by right mouse button and select Inspect element. Completed code of Parser library Enjoy! Google has made so many technical things so much easy to handle and understand.I really appreciate this effort.Your should write something for www.summarizing.biz/auto-summarize-online/ because students really follow this link.Thanks for this post. ReferenceError: "Parser" is not defined. It is true that day by day the demand for the MBA course is really rising and why not? Poeple love to make better career through this. homepage will give you some amazing idea and very effective for the papers writing. How can I scrap the headings ? The new google app makes things so easy for the data scrapping factors and you can really do your data scrapping task with those. to get a new job resume and cover writing is very important . a good resume and cover writing help to get a job quickly . your ideas about cover latter writing is very unique . i found something new from your writing . keep writing like this useful link for the students that is very helpful for the writing services. Why Google Drive ask permission when adding to the library? The best and easy option provided by your article. Thank you for sharing this article. I am receiving the follow error: ReferenceError: "Parser" is not defined. Hi there, while looking at a few solution at scraping Facebook page in the new world order I ended up here. First up great library I'm adding it to my toolkit. I was just curious if by any chance you've found a way to retrieve data from Facebook that doesn't imply using Graph API? I can't stop myself to read this post! Thanks. Kanhasoft is the mobile and web solution developer in India and USA. We are developing a complete enterprise solution to boost the business. Visit our site to know more. exact replica watches, combining elegant style and cutting-edge technology, a variety of styles of replica omega speedmaster watches, the pointer walks between your exclusive taste style. replica gucci shoes, combining elegant style and cutting-edge technology, a variety of styles of replica gucci mens shoes, the pointer walks between your exclusive taste style. Great article! Can someone report this Madin clown for link SPAM? Do you want to setup email signatures for all users in your G Suite domain?